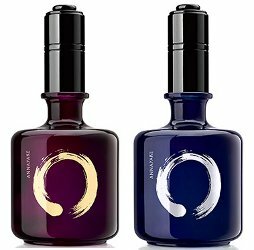 Japanese beauty brand Annayake has launched Tsukiyo, a new fragrance duo for the Tsukimi autumn festival. Tsukiyo for Her (above left) ~ A spicy floriental with rose, mandarin, bergamot, jasmine, peony, leather, vanilla, styrax, patchouli and amber. In Eau de Parfum. Tsukiyo for Him (above right) ~ A spicy woods with black pepper, pink pepper, cypress, elemi, benzoin, nutmeg, sandalwood, patchouli, vetiver and white musk. In Eau de Toilette. The Annayake Tsukiyo fragrances are available in 100 ml. I look at those bottles and all I can think is: those are interesting nail varnishes. I thought the same! But guessing that in person, the size will be a tip off.